Effective classroom management and instruction is the number one goal for an educator. That is something we can all agree upon! However, we also need to ensure that we effectively meet the needs of all our students no matter where they currently stand academically and socially! Students need classroom framework and teacher-led structure. Providing our students with options and choice on a particular assignment makes a huge difference. The students are much more inclined to be enthusiastic about its execution. As educators, we all strive to provide assignments to our students that meet the needs of each and every individual. Unfortunately, that is often not an easy task to accomplish. Our students are growing individuals who yet do not have a full palette of experiences of their own. They are like empty vases that need to be filled. Teachers have an incredible opportunity to be a part of that process. Sure we can make it simple for us, but is ‘simple for us’ equitable for our student diversity? Does simplified education provide equitable instruction? Probably not. Who doesn’t like to be rewarded? Rewards are especially nice when they come with additional effort. One of the ‘New Year’s Resolutions’ that was discussed here at EducationCloset was to help use more of what we have within the classroom, rather than continuously try to find something new. The latter simply adds to our plate of role and responsibility. This ‘more’ ideology typically, and ultimately increases our level of stress. Think of your teaching curriculum as more than simply state-required. Modify your plans and assignments into something that every student, at every level, can do with great personal interest and success. Your rewards will become the natural by-product of an engaging curriculum… One that meets the needs for all of your students! Download this free lesson online resource and then follow my four simple guidelines outlined below to provide assignment flexibility for each student. Using these guidelines, your students will automatically incorporate culturally relevant pedagogy because they will see the relevance in sharing their own experiences. The activity begins with individual student artistry based on the lesson framework. Then it allows them to creatively build on their imagination and their experiences so that they are highly motivated to turn their art into a written story. It is a win-win for teacher and student. Why? Because your students get to ‘do’ art and then provide a creative writing piece for you to assess! Step one of the lesson sequence says to give each student an index card with a red dot on it. Feel free to do just that or depending on grade level, modify the step so that you provide the students with a blank index card and have them make their own red dot. When I allowed this no-brainer flexibility with my class, it was very interesting to see where each student placed their dot, and also the size in which they drew the red dot. This showed me that they were actually thinking about how they would use the dot as the activity progressed. Discuss various situations that you have encountered in your life. A teacher has many life experiences to share, do we not? And we all know that our students are always very interested to learn more about their teacher! Sharing will get your student’s hands to raise right away because they quickly find connections with your story to their own lives and then they will want to share their experiences with the class. Before your students actually start the drawing portion of their activity, spend some time discussing these life experiences. Be sure to include both yours and theirs, so that they will want to make an even stronger connection to their red dot… even if the written story is written as a fantasy. Play some music in the background and allow your students to creatively draw on their card. The drawings they come up with are very imaginative and unique. While walking around the classroom, ask your students questions about the about connections of their drawings to their own lives. This is the part I really like. 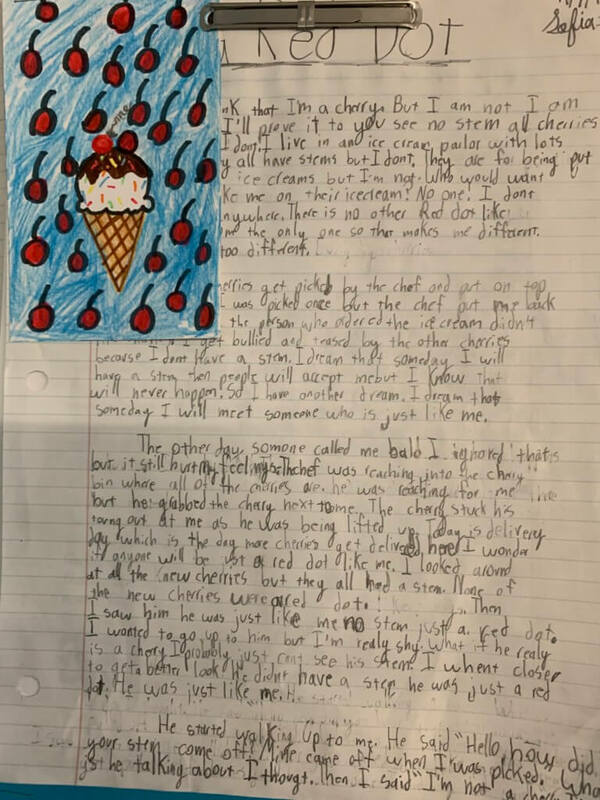 It is the beginning of the nurturing portion of not only their drawing but their written essay as well. You will be able to ask questions and prompt them to think at a deeper level on what they are creating. Once their drawing is completed, you will extend this into a writing project. This is the time to discuss and encourage writing with rich and full detail so that the reader will want to read their story. Remind your students that if their story was captivating to them, it will be captivating to their reader. That’s it! The rest that happens is magic. One of the major contributors to a poorly written essay is lack of sufficient detail. Reason being is that young children don’t always think about adding rich detail because they can already ‘see’ it all in their heads. Or when prompted to elaborate, you may receive an ‘oh yeah’ response. 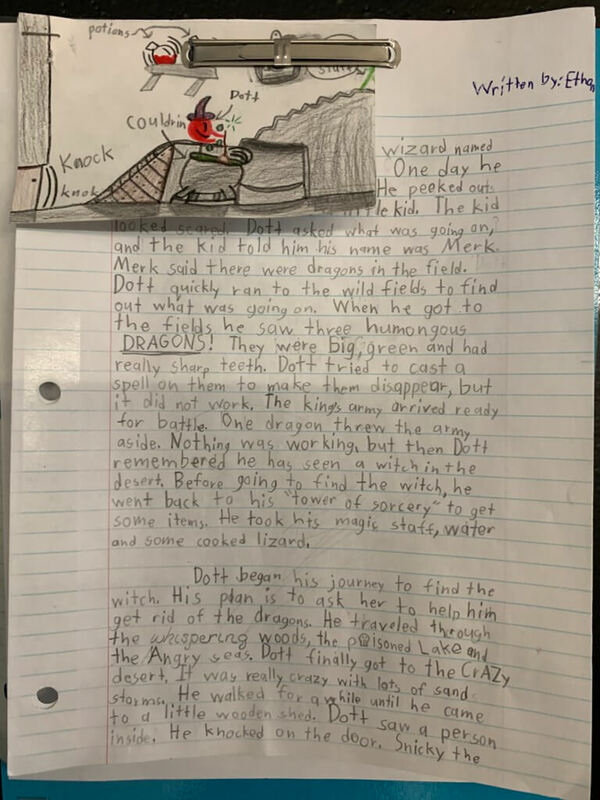 Once students make the sometimes not-so-obvious connection between their drawing their written story, you will begin to identify more of how their individual cultural heritage is weaved into their work. Life is all about experiences, and getting your students to recognize their own experiences is an enriching gift to unveil. During the lesson and to help your students think of ideas, display a variety of culturally-related assignment specific books throughout the room. Doing this will help the students generate ideas that they might not have originally thought, or perhaps inspire detail to weave into the story they are currently writing. Don’t forget! You don’t have to personally own all of these books! Visit your school or public library for temporary use of informationally rich text. When I did this lesson in my class, I was pleasantly surprised to see its outcome. The entire activity begins with the fun of art and imagination, while the writing portion is seemingly ‘harmless’ for the students. The lesson provides an avenue for the teacher and student that is effectively simple for your class to achieve positive writing results!